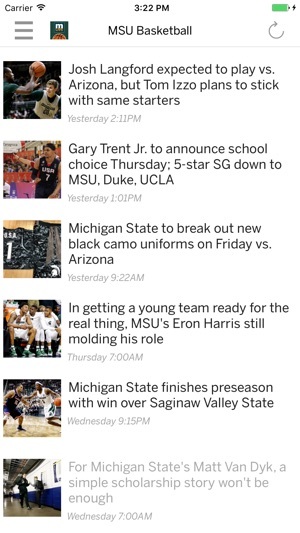 MLive.com: Michigan State Spartans Basketball News app gives Spartans fans exclusive access to the latest news, videos and photo slideshows from MLive.com. Read exclusive articles about the Spartans and other rival teams, catch live Twitter updates from fans and experts, view and submit photos from the game. 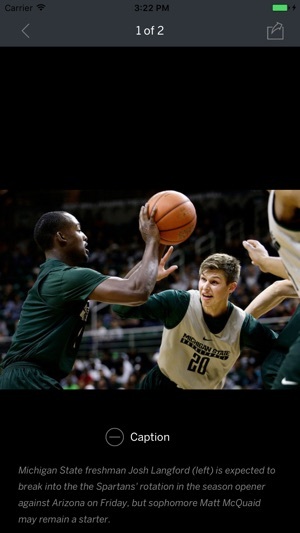 Download the MLive.com: Michigan State Spartans Basketball News app today! What about the Women's Basketball Team? I love having all the articles about the men's team gathered in one place. The football team app has been great this season. But where is the Women's Basketball Team? Defending Big 10 champs, picked to finish 2nd this year and finished in the top 3 in Big 10 for years and made the NCAA Tournament every year of Coach Merchant's tenure. Just played #3 Notre Dame and were in it to the end. How about providing coverage for them? I like sports. This provides me with regularly updated sports content. The embedding of videos and photos, as well as cell phone formatting, has always been mediocre. But, gotta ride the snake of local sports so where else you gonna go? The best msu app to stay up to date! Mlive always keeps me up to date and notifies me of the latest news about my favorite team! I'd highly recommend you download this app if you love Michigan State! Go Green! !